HAKAINDE Hichilema should not be voted into power because he has refused to sign a peace accord and attend the national day of prayer to call for peaceful elections ahead of August 11 general elections. Speaking when he received 100 defectors from the opposition UPND in Lusaka yesterday from Mandevu constituency, Patriotic Front (PF) Lusaka youth Chairman Kennedy Kamba said the PF party was committed to violence-free campaigns in the province ahead of the August 11 elections. 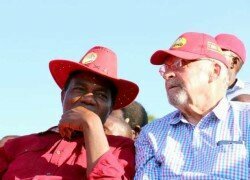 ‘’Hakainde Hichilema refused to sign peace accords to stop violence, he has also refused to attend national day of prayers, and just yesterday the police in Kasama arrested 28 youth who were found in possession with petrol bombs, machetes and other offensive weapons; now youths is that the kind of a leader you what to vote for? asked Mr Kamba. He asked Zambians to turn out in large numbers and attend prayers for peace ahead of the general election and shame Mr Hichilema and other political parties that have decided not to attend the prayers. Mr Kamba expressed gratitude that the youths were organized at branch level and it will produce positive results on the polling day. Mr Kamba said the ruling party has demonstrated restraint as a way of respecting President Edgar Lungu’s call for a peaceful campaign, adding that there was no justification for political parties to fight. He said political party campaigns should be issued-based, adding that the PF was relying more on explaining projects it had delivered in all parts of the country. Mr Kamba called on Zambians to vote for President Lungu who is a God-fearing man and has heart for the people so that development projects continued. PF Intercity bus station branch chairman Francis Muchemwa said insinuations that the bus station was known for violence was not true. And speaking on behalf of the defectors, Nicolas Muchimwa said they have joined the PF because it was a peaceful party with good policies.